'Secret Weapons' was one of Valiant's best comics in 2017 and writer Eric Heisserer has returned with a one-shot that tells the backstory of Nikki Finch. One of a group of rejected psiots whose powers were deemed useless by the Harbinger Foundation, Finch with her ability to speak to birds proved she was invaluable as part of the team and along with artist Adam Pollina, Nikki's story is told in vivid detail. Under the ruse of a special collegiate program based on an old gymnastic routine, Nicole "Nikki" Finch is pursued by the Harbinger Foundation for years to undergo psiot activation testing. It's not framed that way at first, of course, the program comes across as a mere collegiate scholarship but what Nikki doesn't know yet is that one in four survives the process. Heisserer takes a clever approach by using a dated timeline that covers her pre-Secret Weapons arc up until where the first issue begins. The wide four-panel layouts of each page give penciller Pollina and colorist David Baron plenty of room to present a colorful snapshot of Nikki's journey from high school to the Harbinger Foundation to The Willows. They all really cover a lot of ground in very concise ways that convey enough information despite spanning several months. 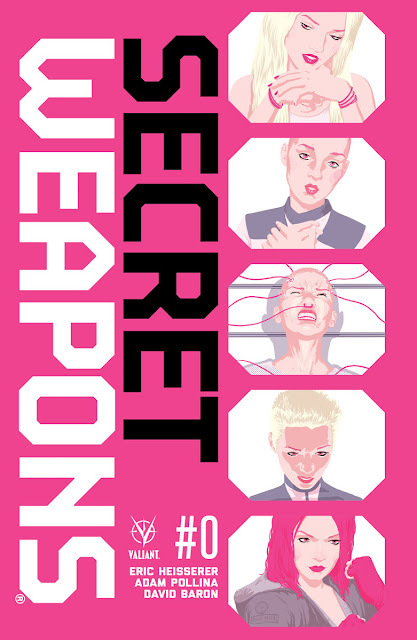 A new reader doesn't necessarily need to have read Secret Weapons (but really should anyway, it's great) beforehand as this is basically an origin story that could be the basis for the other members of the eventual team. More importantly, this one-shot develops the character, Nikki, as her hopes and expectations are built up putting her at odds with her parents until finally undergoing the dangerous procedure only to be discarded because she's considered a "work-in-progress" but feeling like a C-list psiot. It's a roller coaster of emotions that Pollina captures perfectly with a range of facial expressions and body language. When Nikki reaches her lowest point, Heisserer's dialogue with some unexpected supporting characters hit a pointed and poignant note that adds layers to this flashback issue. 'Secret Weapons' #0 may not include much action but this character study reveals a lot about Nikki and the Valiant universe. It's a good primer for new readers and a bonus for 'Secret Weapons' fans. Heisserer as the screenwriter of the film Arrival has shown that fantasy science fiction and superhero stories can be thoughtful and engaging without cheap thrills or over-the-top set pieces. 'Secret Weapons' #0 succeeds because rooting for the underdog is still an elemental part of the human experience where conquering fear and doubters is as exciting as ever.